Man Cave? Nope. CHEESE CAVE! So. You’ve mastered the making of your favorite fresh cheeses. You can whip up a batch of cream cheese or fromage blanc but you’ve been tossing around the idea of making your own homemade aged cheese for a while now. Why not? Your friends brew their own beer, make their own wines, kombuchas, you name it. You love cheese. Asiago. Gouda. Havarti. Blue. And of course your go-to Cheddar. While some cheeses are more difficult to age and require a substantial investment, you can easily create your own Cheese Cave for many varieties quite simply and economically. Historically, cheese has been aged in caves – an environment usually cool and with consistent humidity. Most cheeses age well with maintained temperatures between 45 and 58 degrees Fahrenheit and 80-98 percent humidity. For those of us who don’t happen to have a natural cave in our back yard, here is a simple way to create your own “Cheese Cave” cellar at home! Hit up your local Walmart, Target or Sears (or Craigslist or local classifieds) and purchase a mini dorm-style fridge. Be sure it doesn’t have any circulation fans, as this will cause your cheese to dry out and crack up. These are the ones that come with the little freezer with a drip tray inside. Next, you will need to purchase an external thermostat controller (external refrigerator thermostat) – these typically run anywhere between $35 – $150. Simply plug the refrigerator power into the thermostat and place the thermostat sensor bulb inside the refrigerator. Be sure you are careful not to kink its thin tube. You can tape the tube to the edge outside the door to avoid kinking. The external thermostat will now start and stop the refrigerator, maintaining the proper temperature for your queso. You can pick up a digital or analog cigar hygrometer super inexpensively on amazon ($8-$15), or go all-in and purchase a remote digital weather station for around $40. Keep an open container of water (Rubbermaid makes a great flat take-along) or a wet towel in your Cheese Cave to increase humidity, and monitor it frequently with your humidity monitor to make sure it stays within the cheese’s specific humidity perimeters. 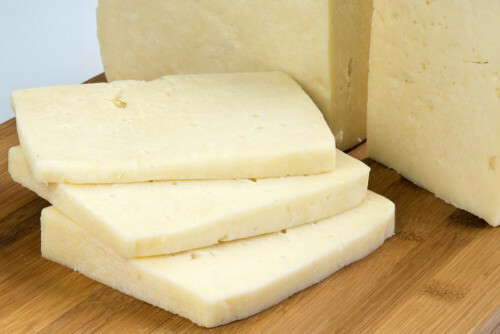 Some cheeses can take months to age, and can go bad in a matter of hours if left unchecked. That would make you more blue than that cheese that just went south. That’s it! So put a Cheese Cave in your Man Cave (or Lady Cave!) and let the yum begin! !